In a medium frying pan, heat 2 tablespoons olive oil. Add the onion and peppers, cook for 3 minutes or until soft. Add the tomatoes to the pan and cook for 2 more minutes. Remove from heat and reserve. In a large saucepan, add wine, 8 cups of water and 1 tablespoon salt. Bring to a boil. Add the green beans and cook until tender. Remove the green beans from the water and add the salmon fillets, turn off the heat. Leave the salmon fillets in the water for 15 minutes to cook. In a small bowl, whisk the mayonnaise, sour cream, lemon zest, 1/4 teaspoon salt and 1/4 teaspoon pepper until well blended. While the green beans are still warm, place them in a mixing bowl and add the red pepper, onion, tomatoes, fresh spinach, peanuts and lemon juice. Mix well. Season to taste with salt and pepper. 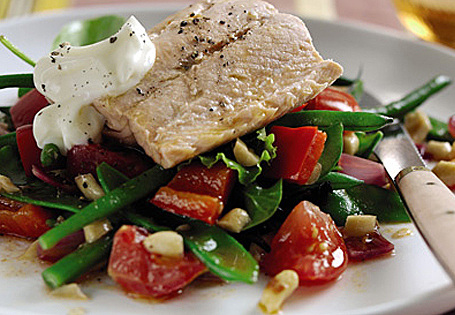 Place the salad mixture onto 4 bowls or plates, top each with a cooked salmon fillet. Serve with one tablespoon of the dressing.